Free and Open to the Public. RSVPs optional. Join us for a dynamic evening of learning and conversation, exploring the harm of segregation and how we can work together to build the beloved community where we live and learn. This event is part the Building the Beloved Community interfaith initiative, organized by the FHJC, Union Theological Seminary and the Interfaith Assembly on Homelessness and Housing (IAHH). 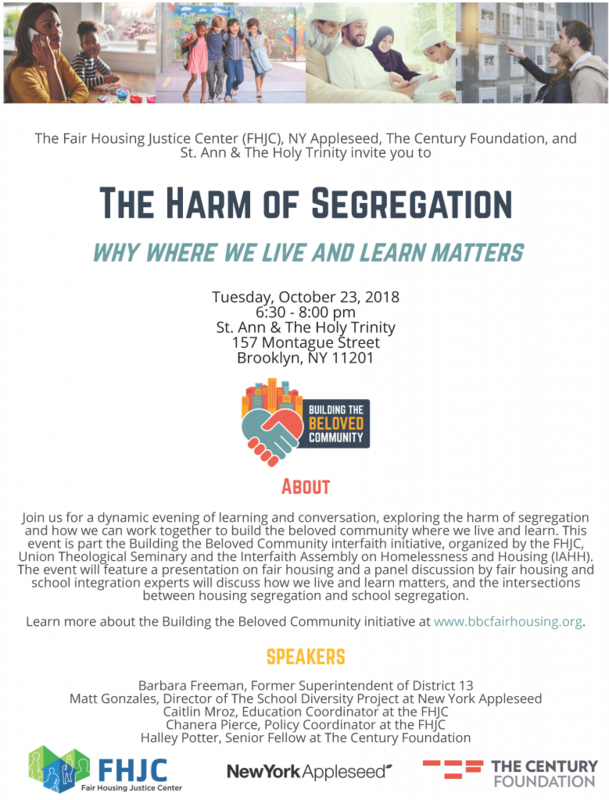 The event will feature a presentation on fair housing and a panel discussion by fair housing and school integration experts will discuss how we live and learn matters, and the intersections between housing segregation and school segregation. I am a retired teacher, who recently responded to a picture of my third grade class, posted by my daughter. I got many response from these students who were ” pictured.” I want to have a mini reunion with my former students to discuss what was , as this school community no longer exist. At this meeting, I hope to engage in discussion of “The Beloved Community.” These former students are in their 50’s and have grand children.. This is the age that can have a great impact in rebuilding our neighborhood communities that have been lost to”Urban Renewal.” These are neighborhoods that are “food deserts”. Any Ideas..?